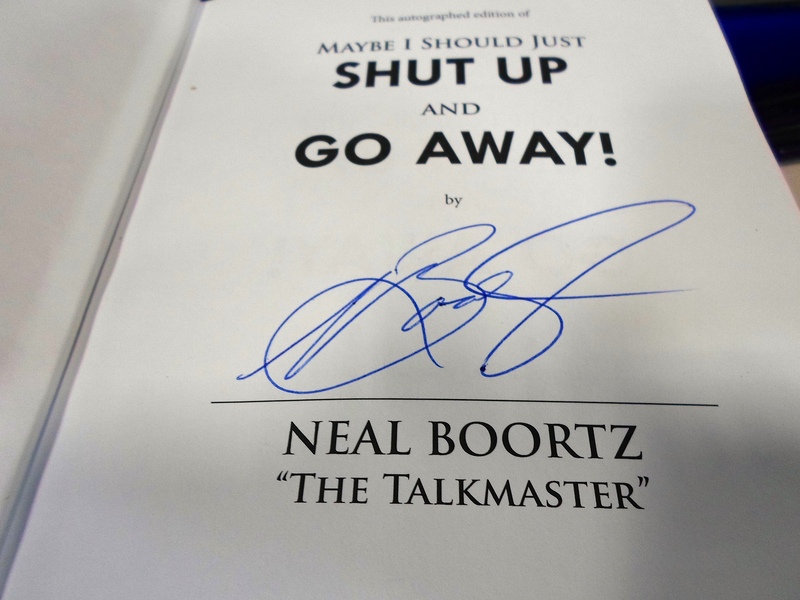 Neal Boortz Signed Book - Maybe I Should Just Shut Up and Go Away! This Autographed Hardcover Edition of Maybe I Should Just Shut Up and Go Away! has been personally autographed by Neal Boortz and includes a deluxe leather collector's box. Exclusively Made Available at PremiereCollectibles.com. For 42 years, nationally syndicated talk radio host and NYT bestselling author Neal Boortz has been entertaining, aggravating, enraging and captivating radio audiences. In his memoir, Maybe I Should Just Shut Up And Go Away, he looks back across the decades and shares the often-hilarious reality of what happens behind the scenes when you’re a talk radio icon. Longtime friend with national radio greats Rush Limbaugh and Sean Hannity, he tells how those relationships began in the hot seat of competition. Tributes are included from Rush Limbaugh, Sean Hannity, Home Depot Founder Bernie Marcus and 2012 presidential nominee Herman Cain. Though early predictions by those who knew him in his youth cast Boortz as a sure prospect to become a preacher, he took a different route to educating the masses. Longtime listeners are certain to become enthusiastic readers as Boortz finally tips his hat to more than four decades of teeing up controversy, political education and general entertainment for audiences across the country to enjoy—and tells all they’ve been wanting to know but couldn’t get anyone to share until now. For 42 years, nationally syndicated talk radio host and NYT bestselling author Neal Boortz has been entertaining, aggravating, enraging and captivating radio audiences. His book, The FairTax Book, debuted at #1 on the New York Times Bestseller List. His fourth book, Somebody's Gotta Say It, debuted at #2 behind only Barrack Obama's book, The Audacity of Hope.